Whiteway, J.r.. "Ontario Hydro". The Canadian Encyclopedia, 04 March 2015, Historica Canada. https://www.thecanadianencyclopedia.ca/en/article/ontario-hydro. Accessed 20 April 2019. Ontario Hydro was a Crown corporation owned by the Ontario government until it was privatized in 1999. Ontario Hydro's fate was under a cloud with the Harris government's plans to privatize the utility (courtesy Ontario Hydro Archives). As founder of Ontario Hydro, Beck helped establish the public enterprise tradition in Canada (courtesy Ontario Hydro). Ontario Hydro was a Crown corporation owned by the Ontario government until it was privatized in 1999. 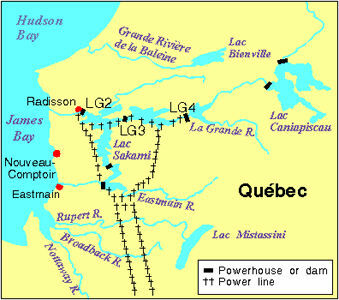 It was the first provincially owned electric utility in Canada and was the largest public electric utility in North America. Its generation and transmission system included 69 hydroelectric, 8 fossil-fueled and 4 nuclear power stations, along with over 130 000 km of transmission and distribution lines. In 1992, the utility had a $34 billion debt, largely because of overbuilding costly nuclear plants. Maurice Strong, hired to restructure the company, put an end to construction and cut 7000 employees. By 1996, Ontario Hydro held assets of $40 billion. 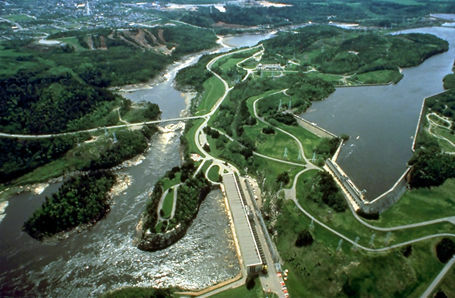 The system provides power to an estimated 3 million customers in Ontario, in all areas of its 650 000 km2 jurisdiction. The utility began as a special statutory corporation (like a crown corporation) established by the provincial legislature in 1906. Its founding chairman was Sir Adam Beck. In 1908, just 2 years after Ontario's legislature passed the Hydro-Electric Power Commission of Ontario Act, the novice utility entered into agreements with 14 municipalities to provide power at cost. Similar agreements now link Ontario Hydro and 316 co-operating municipalities. The utility is responsible for the generation and transmission of electric power and for its sale to participating utilities. It also acts as a central supervisory body with authority to approve and control certain features of the utilities' operations. Ontario Hydro also plays a prominent role in nuclear technology, with 4 stations producing 60% of Ontario Hydro's output. Nuclear technology has brought new problems and responsibilities, eg, nuclear safety, irradiated fuel management and other environmental concerns, each of which is given high priority by Ontario Hydro. 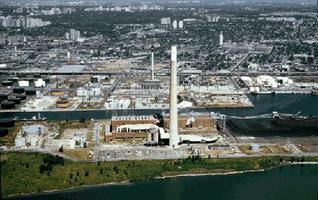 In 1997 the company announced the shutdown of 7 older reactors at Bruce and Pickering. In February 1997 Mike Harris's Conservative government announced its intention to privatize the company. In 1998 the company wrote $6.6 billion off its books, a move that resulted in a $6 billion loss, the largest in Canadian history, rendering the crown corporation technically bankrupt. In November 1998 the Energy Competition Act created a new competitive electricity marketplace in which customers would be able to choose their electricity supplier. 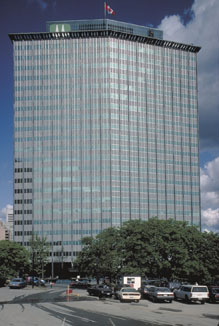 Ontario Hydro ceased operation on 1 April 1999, replaced by several companies, 2 of which are large commercial interests - Ontario Power Generation and Ontario Hydro Services Company (OHSC). The 2 companies operate independently. The transmission and retail energy services, businesses formerly held by Ontario Hydro, are retained by OHSC. Ontario's transmission network is owned and maintained by OHSC, which does not operate the network or control access to it. The Independent Electricity Market Operator, a provincial crown corporation, has responsibility for ensuring that all participants have fair access to the transmission system. H.V. Nelles, The Politics of Development: Forests, Mines & Hydro-Electric Power in Ontario 1849-1941 (1974).